Summer heat and humidity can be formidable if you don’t have air conditioning. You can run the fan all day long. It will make your house just bearable enough for you. But you don’t want your home to be bearable. You want it to be comfortable. You need central air to cool your home’s interior temperature and circulate indoor air. At Action Air of Florida, we perform air conditioning installations throughout Orlando, FL, and the surrounding areas. As an owner-operated local business, we’ve been helping Floridians get comfortable with our high-quality central air units, repair services, and air conditioning installations for more than 25 years. Before you order an air conditioning installation, contact our team of certified technicians and request a free onsite estimate for central air. 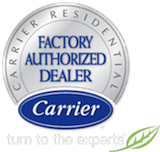 We’ll provide you with a cost-effective option for the purchase one of our quality Carrier air conditioning systems. Once you’ve purchased your new central air system, do not forget to service the system each year. If you experience any issues with the new system, all repairs are covered for one (1) year on all labor and material. Instead of suffering through summer heat, shop our affordable line of central air conditioning and heat pump systems and order your installation today. Our certified technicians will arrive when scheduled and quickly install your new air conditioning system. Within a short period of time, you’ll be enjoying a cooler, more comfortable home while saving money on your electric bill! To schedule your air conditioning installation, call us today at (407) 521-0400. Are you concerned about how you can afford a high-quality central air system in your home? Don’t worry. We offer financing options to qualified customers. Feel free to apply for financing on our financing page.